With a County Antrim Shield in the trophy cabinet and an Irish Cup final on the horizon, third-place Crusaders have some measure of consolation over losing grip of the Gibson Cup. However, Baxter points out building blocks in place at the Seaview club designed to result in long-term gains off the short-term pain. “We will not give up the chase for second spot until it is mathematically impossible and we will obviously place great importance on the forthcoming Irish Cup final but if we cannot win the title then our league target is as high a finish as possible,” said Baxter. “The financial rewards for European qualification are significant and the post-split fixtures provide tests against the top teams, so there is still so much at stake. “Over the course of a 38-game league campaign you make decisions along the way towards achieving your goals. “We’ve been on the periphery of the title race for much of the year but I believe the transition into full-time football has provided major benefits. “It has allowed us to put in place foundations not just for next year but the next 10 years. “We have to be pleased at how things stand in year one of this process and it is a starting point towards something bigger. 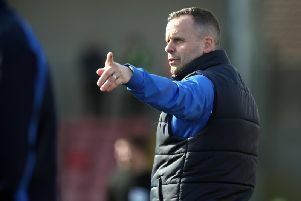 Glenavon manager Gary Hamilton is urging his players to enter the final five fixtures on the front foot. The Lurgan Blues’ bid for a second successive third-place finish will face a test at home to defending champions Crusaders. The first meeting of the post-split programme presents Glenavon an opportunity to close the gap on the Crues to a single point. A run of three consecutive wins - and the same number of clean sheets - should serve as a boost in confidence as Hamilton hits the run-in determined for a strong finish. “We go into the split aiming to win every game then see how things stand,” said Hamilton. “Another third-place finish would be great and European qualification is obviously a massive boost given the cash injection and budget impact. “To get third, irrespective of how Europe pans out, would be great and we will continue to fight until it becomes impossible. “We have seen the January signings really settle and you look at Eoin Wearen and Seamus Sharkey at the back as two players with experience. “Eoin, especially, is a great talker and organiser, so that has been helpful in this positive run. “We will need that defensive strength to cope with the Crusaders threat, especially someone like Jordan Owens and his aerial ability alongside Paul Heatley’s pace and movement. “But, also, it is important to push hard towards getting a win and make sure we make the most of every opportunity.